Paul Gulacy has drawn comics and covers for titles like Star Wars, Batman, James Bond 007, The Terminator, Master of Kung Fu and Catwoman, etc. This art book is a selection of some comic pages and covers, accompanied by personal commentary, with a few guest quotes. I like the Noir style he applies to some of his panels. Additionally, there are a few personal unpublished ink sketches as well. In the commentary, he talks about his career, inspiration, techniques, the comics and the characters he draws. Being a big fan of Bruce Lee, he once photographed the movie Enter the Dragon frame by frame because there wasn't videotape at that time. Master of Kung Fu was also inspired by Bruce Lee. 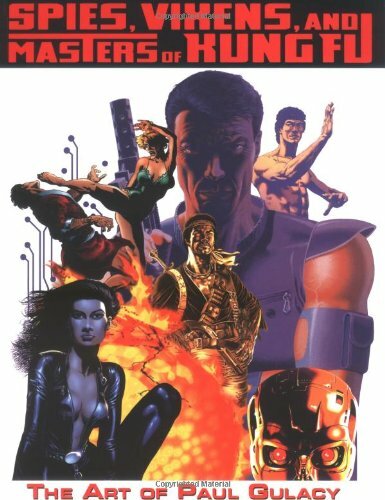 The main comics that were given more coverage in this book are Master of Kung Fu, Batman and James Bond. The other series are mentioned briefly, with illustrations included. The art book is in a way a mini biography, recommended for fans.